If you are thinking of fishing Chesil this weekend, I would get your gear and head on down there as soon as you can. Looking at Windguru there is a lot of wind heading our way. It is going to be coming from all over the place today before settling into a steady strong wind this evening. Tomorrow looks border line for conditions, but it will depend on how the sea state builds. If you are looking for Cod I would think about looking elsewhere. Apart from the odd one they are not around at the moment. However when this forecast rough weather settles it will be worth trying then. Tides are similar to those of two weeks ago, when there was a lot of Undulate Ray caught. I had an email from Bob, one of my regular contributors who fished Seaton on Thursday during the day. His catch was mainly Pout with Rockling and a small Thornback Ray (thanks Derek for pointing out my simple mistake). Chesil Beach: A rough short chop with 2m waves. The water is lightly coloured. Portland: A 1.5m swell with slightly coloured water. Portland Harbour: Calm with slightly coloured water. Weymouth Bay: Calm but the water has a bit of colour especially around the harbour entrance. Chesil Beach forecast: Pout and Dogfish are making up the most of the catches both during the day and night. With Whiting putting in an appearance after dark. Dabs and Rays are worth targeting. 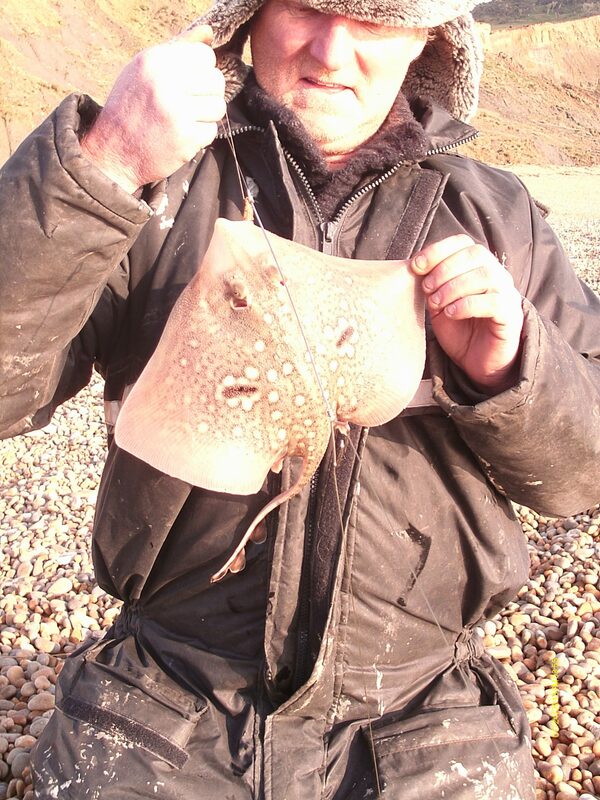 At this time of year the Rays prefer large squid or Peeler Crab baits. Portland: I think I might give it a go for a big Wrasse today. Medium sized tides are excellent for fishing the Island. As much as I love fishing for Wrasse with lures, if you are after a big Wrasse at this time of year you need to use crab. Unlike most species Wrasse will happily take a hardback crab and are especially fond of Velvet Swimmers. I will put up a post this weekend on using crabs as bait, so look out in the fishing tips section for that. Portland Harbour: Very poor at the moment with Flounders just about the only species that are around. Weymouth Bay: The piers are fishing well for Whiting, both during the day and at night. Plenty of Pout are also being caught with the odd Flounder and Pollock. Preston is good for Flounder and Whiting. Preston could be one of the few beach marks that will be sheltered once the winds come in tomorrow. Poole Harbour: I am not hearing any great reports from Poole, but I am sure it is still worth giving it a try. The colder the weather the further out the crabs will go, so fish close to shore for the best chance of a Flounder.